why Leopard barrel elevates after shooting? After a short reading the FM: There are no conections between the NBC System an the FCS. This System contents of two Parts, One is the Overpressure and Filter System. This System gets contaminated Air over 3 Filters in to the Tank and produces a Overpressure of 4 mBar (or 4 cm water column, its nice at rainy conditions too) The other Part is the so called Auflauframpe, that is the mechanism that open the Breech after firing a Round, this mechanism can be switched off. Loading Position is activated by a Switch called "Rohr vorn" (Gun Front). So, even under NBC Conditions the FCS must go into Loading Position if Breech opens or not. Save is Save, you only can Fire the Gun in the Emergency Mode (Gunner must switch it on). That is up to a mix of Safty Issues and german Doktrine. First you learn as a Loader: Load and press Save, Unsave when the Gunner is ready to Fire. No, you can´t use this Poti for calibration FCS Data. It´s more the other Way, the Trunnion Resolver gives Data Gun out of LOS to FCS and will respond "No coinsident". Ohhhh The loading Position was made to protekt the Loader and much more the Cartridge while shooting from the move. In Leopard 1 you have Brass Cartridges and the Ready Rack is left of the Breech. 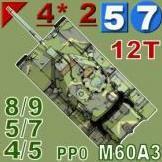 In Leopard 2 you have the Ready Rack in the Back of the Turret and the Cartridge is from "Paperworks". The likelihood of damaging the Cartridge while loading it when Stab is working while Tank is moving over rough Terain is very high ! So a System was made that brings the Breech to a stable Position. The Loader can (I think even german Tank Crews don´t know that) elivate the Breech Position with a Potentiometer (is this right in english?) to his best Loading Position. It is not nessesary to have the Gun to a 30° Position as you can often see in Youtube Vid´s. When the Gun is fired and the Breech is back in its front Position the FCS send the Signal for Loading Position, Loader grab the next Roud, load and have to presse "Save" or "Fire", then FCS send Signal and the Gun goes back to Firing Position. This works only when Main Gun is activated and STAB is on. If Loading Position is activ you can´t fire the Gun I´m not 100% sure, but I think you can switch "Loading Position" off..... In the Pic you can see the Loader Control Unit, the Potentiomter (Ladestellung) and the Control Lamp "Ladestellung". Sorry, but Koblenz does it wrong. What you see ist a "Halfcut" of a 0-Series Kampfpanzer Standart from 1964 and they present KE Rounds with it ? Not that what I aspected from a "Studiensammlung". It´s not to block movement, this can be done in the Map Editor. It´s more the LOS trough Woods. With the Editor that now is in use, you only can choose between "Big Trees" or "Small Trees" for one Pixel of Map. All the Bushes, Gras and other Foiliage is to small to Block LOS and TIS. So I think we need a new Concept of Woods in SB. 1979 ish Canadian Leo c1 ? 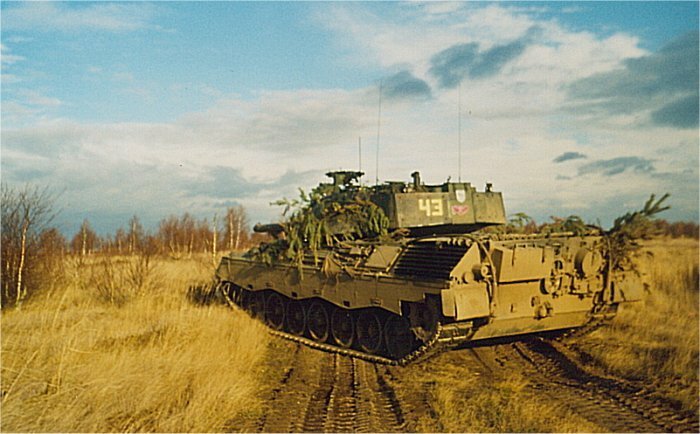 Is there a German word for the Leopard 2A5/6/7 wedge armor?